People such as I in the western developed world tend to take the Internet for granted, but we often forget that there are a lot of people in the developing world who don’t have access to the Internet at all, or even just basic access to a laptop. 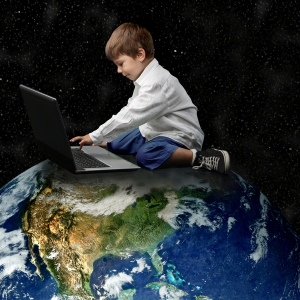 If more children were given access to a laptop, taught how to use it, and taught how to use the Internet, then not only would they grow up computer-literate, but they would also be given a glimpse, via the net, of the wider world around them. If that isn’t a very worthy cause, then I don’t know what is. Our infographic today is on the “$100 laptop”, a scheme unveiled 7 years ago to provide a cheap basic computer for every child. Looking at the specs, it seems to be quite an impressive model, bearing in mind the negligible price. I don’t care too much for the colour but I can’t argue with the internal hardware specs. And these computers are now making their way all over the world, with the biggest recipients currently being Peru and Uruguay. Let us know in the comments what you think of the “$100 laptop” ideal. Do you think it’s realistic that every child in the world can finally be given one of these laptops? What do you think of the computer’s hardware specs? And isn’t green a terrible colour for a computer? Sound off below in the comments. It's a shame that in here, Honduras, about 3 years ago, in a renowned science educative center in Tegucigalpa the OLPC project reached, but the hardware was handed to boys and girls of high economical status of the most expensive educative centers in town as "school trip gift" while many other kids in the country are so poor they even receive their classes in the yards of the school for the lack of classrooms, and many of them even have notebooks or pencils to take notes (and even in extreme cases they should carry a chair or a box from their own house). I thought the project had died. I hadn't heard much about it since it first launched. With the current availability of the Rasberry pi I still find it hard to believe how hard it is to get kids access to technology. As a teacher, I don't think Laptops are needed, especially ones that can be taken home, but the fact that we can't seem to make it happen seems odd. India is already a step forward with Akash tablet. The government has planned to provide these tablets to the students at a subsidised cost. I have wondered how this idea fared... 2.4 million is way above what I expected! I don't think it's that cluttered. It might look hard to read because I had to compress it to fit on the page. But if you click on the infographic, you will be taken to a larger version on the page I got it from.